Te Papa Tongarewa, the national museum of New Zealand in Wellington, was designed from the beginning as a bicultural institution. The museum 'acknowledges the unique position of Māori in Aotearoa New Zealand and the need to secure their participation in the governance, management and operation of the Museum'. The meeting house Te Hono ki Hawaiki, shown here, stands in the museum's marae, Rongomaraeroa. 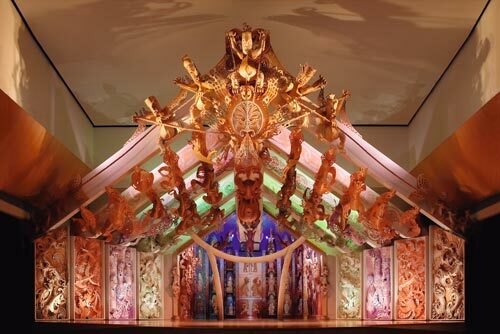 The panels in front represent Māori stories and traditions, while those at the rear stand for the various non-Māori who have made New Zealand their home.